Henry Ford Bridge (1996 replacement bridge, slightly raised, in foreground), and the Commodore Schuyler F. Heim Bridge (background), at the Port of Los Angeles. The 1924 Henry Ford Bridge in the half-closed position as seen in 1994. The Henry Ford Bridge, also known as the Badger Avenue Bridge, carries the Pacific Harbor Line railroad across the Cerritos Channel to Terminal Island from San Pedro, to serve the Port of Los Angeles and Port of Long Beach. It is located in Los Angeles County, Southern California. It was built to accommodate operations at the Ford Long Beach Assembly plant which opened in 1930 and was closed in 1959. 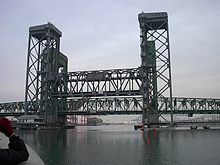 The original 1924 bascule bridge was dismantled and replaced in 1996 by a vertical-lift bridge. The contract for the bascule bridge was placed by The Los Angeles Board of Harbor Commissioners in 1922. The bridge was designed by Joseph Baermann Strauss and fabricated by the American Bridge Company. It was formed of a pair of 110 feet (34 m) trunnion bascule leaves which formed a one span Warren through-truss. There were two 50 feet (15 m) tower spans and two 200 feet (61 m) timber approaches. ^ "CA-103 Commodore Schuyler F. Heim/Henry Ford Bridge". Retrieved May 28, 2013. ^ "Port of Los Angeles Visual History Tour - Badger Avenue Bridge". Retrieved May 28, 2013. ^ "Henry Ford Bridge". February 6, 2012. Retrieved May 28, 2013. Wikimedia Commons has media related to Henry Ford Bridge. This article about a bridge in California is a stub. You can help Wikipedia by expanding it. This article about a specific rail bridge in the United States is a stub. You can help Wikipedia by expanding it. This page was last edited on 12 August 2018, at 01:20 (UTC).